Charro Aguayo was one of the wrestling pioneers in Mexico and one of the first true lucha stars. He moved to the United States where he began wrestling under the name "Cactus" Pete Brown with moderate success. He eventually returned to Mexico where he debuted as El Charro Aguayo on April 3, 1934 against Marvin Barackman, at the Teatro Iris. His biggest claim to fame is that he was the first National Heavyweight champion, as on June 21, 1934 he defeated Manuel "Toro" Hernández in Mexico City to capture the vacant belt. He never lost the title, so it was vacated many years after he won it. While he was not a man with culture (he didn't know how to read or write as his family couldn't give him proper education), he definitely had a gift for wrestling. He has been regarded by many, in both the media and the business, as a sharp and smooth wrestler and shooter, a fast thinker inside the ring, and a legitimate tough guy. He's also credited with being the creator of the submission hold known as La Mecedora (the Rocking Chair) that is still used, and it's said that he executed it with such finesse that nobody else has been able to do it justice. He became popular facing a lot of huge foreign men like a German giant called Stephan Berne, Jim Lott or a huge black wrestled called Abulofobia. He'd usually lose the first match, but he was unbeatable in re-matches. In the third fall of those, he'd usually squash his opponents and the crowd loved it. This formula worked during many years and it gave a lot of money to the Lutteroth family. 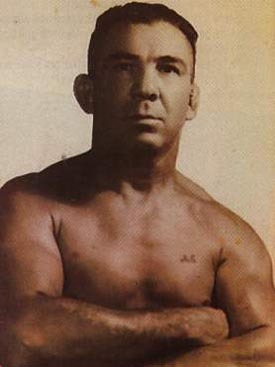 Aguayo (no relation to Perro Aguayo) was married in the ring in his hometown of Torreon, Coah., where years later a lucha building was called "Coliseo Charro Aguayo". He was a popular sports star during the 30s, and he had an acting role in Cantinflas' very first motion picture in 1939, entitled Cantinflas y su Prima (Cantinflas and his Cousin). Charro Aguayo died on September 22, 1963 in Tennessee.